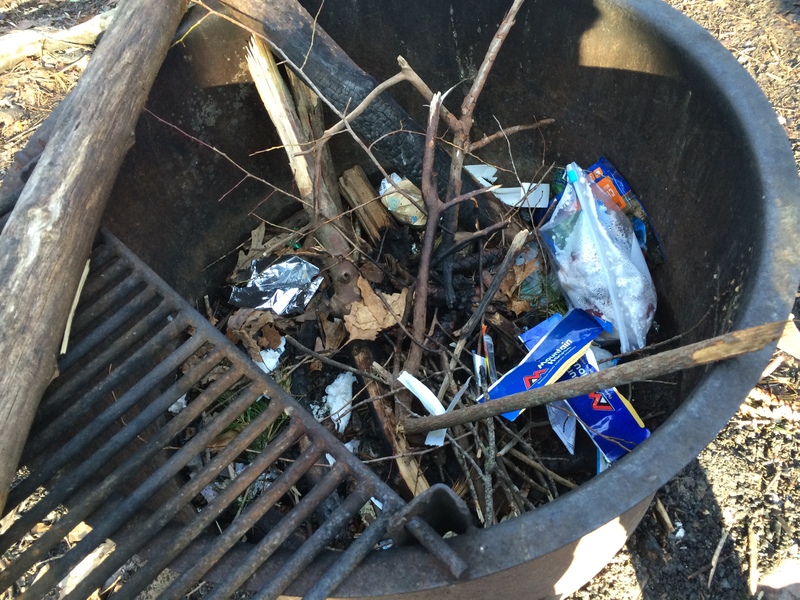 Gene from Brooklyn gets a “Trail Karma” award for picking up other people’s trash. 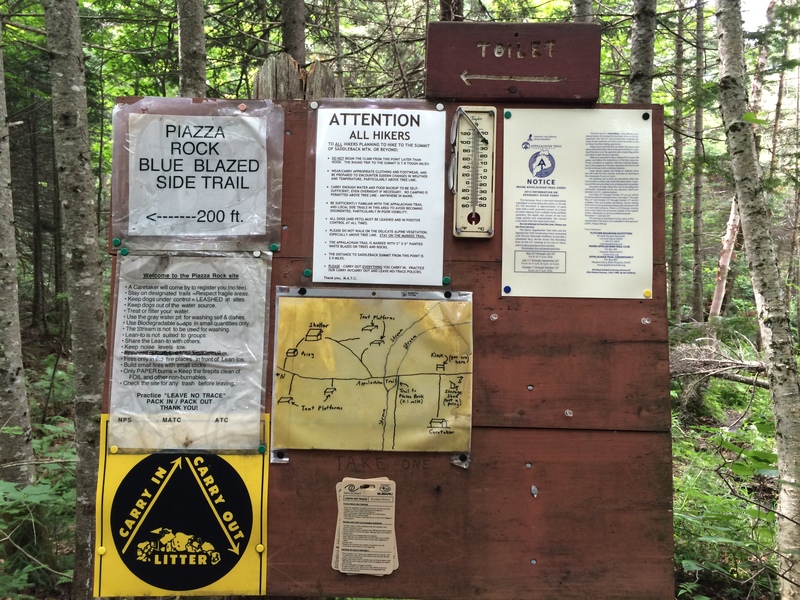 Appalachian Trail, Sunday May 10, 2015 — People are loving our national hiking trails to death. The Appalachian Trail (AT) alone is estimated to see up to three million visitors per year. Looking at it one way, that’s enough boots on the ground to bruise the rocks rather than the rocks having the opposite effect on the hikers’ feet. It’s sort of like hammer vs. nail in role reversal isn’t it? The collective environmental impact generated by all these people is enormous. They generate human waste, leave trash, trample vegetation, erode trails and mark their passage in many other unwelcome ways. There are many means to mitigate this impact, but before we talk about that, here’s the back story. Most people experience our national parks and forests in what is known as front country. Front country is civilized, distinguished by infrastructure such as roads, picnic tables, flush toilets, trash cans, concessions and parking. You know about more about front country than you may think. That’s where Yogi, Boo boo and Mr. Ranger did their Jellystone schtick. You get the idea. Most people never see the back country and hardly realize it’s even there. The primary reason may be that a lot of muscle power is usually required to get into the back country. In other words, you have to sweat. Been to the mall lately? Observations suggest that fewer and fewer Americans are up for back country excursions. Supersize soft drinks aside, nevertheless there’s no shortage of back country hikers. The problem comes when people show up in the back country and don’t know how to limit their impact. Within my experience, they fall into two primary groups. One group fancies themselves as romantic throwbacks applying their survival skills and living off the land in ways promoted by Jack London, the Boy Scout Handbooks prior to the 1970s, or the Bear Grylls TV series today. If everyone behaved this way in the back country, it wouldn’t be long before they’d turn paradise into a denuded moonscape. When you spy someone with a axe, hatchet, machete or (the very heavy) Bear Grylls brand gear on a national hiking trail, you might be looking at one of these folks. 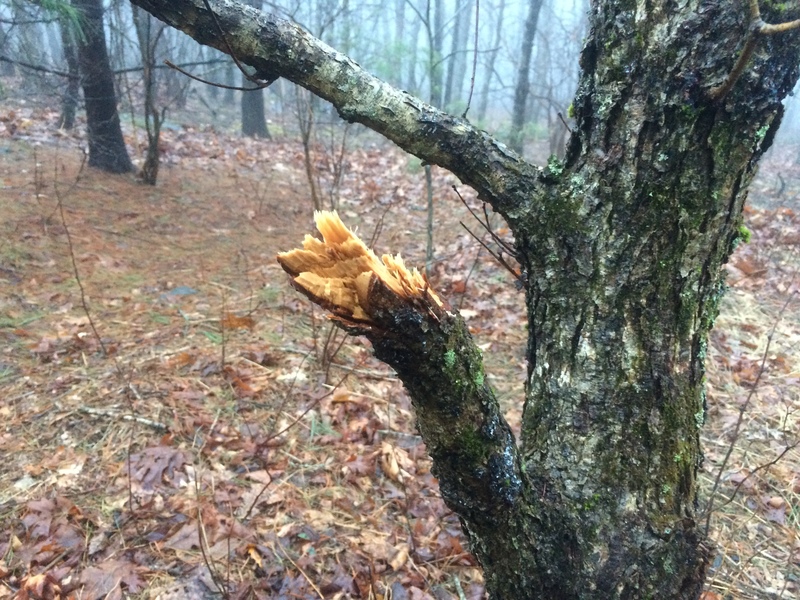 Machete damage. Green wood doesn’t burn by the way. The other group is simply clueless. Finding no back country trash cans, they just drop their garbage where they stand because they don’t come prepared to carry it out. They befoul water sources with human waste. They trample vegetation. Overall, their practices put the back country environment at risk. 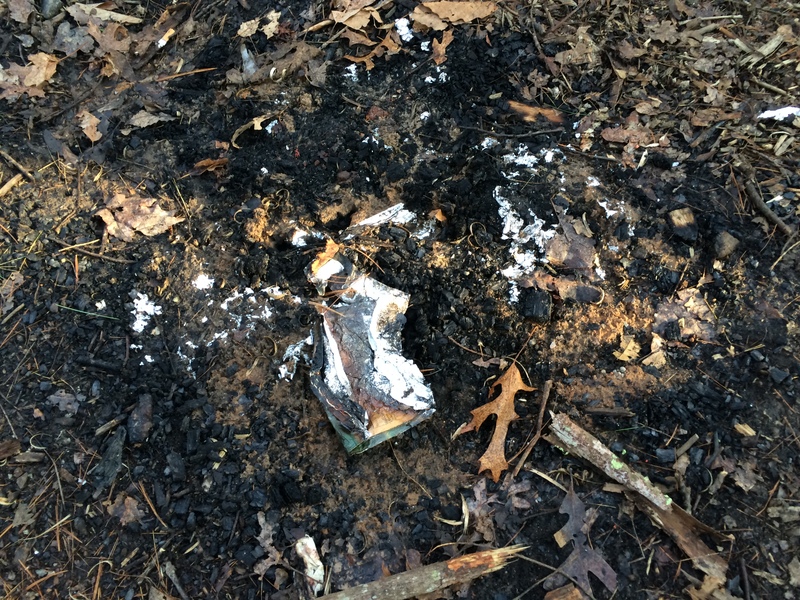 Ignorant people leave their trash in fire pits. It doesn’t burn completely. In time, minimum impact morphed into the Leave No Trace ethic. Leave No Trace is based on seven principles designed to help not only to minimize human impact, but also to maintain the highest quality wilderness experience possible. Minimize Campfire Impacts: Because the naturalness of many areas has been degraded by overuse of fires, Leave No Trace teaches to seek alternatives to fires or use low-impact fires. Fortunately most hikers are aware of Leave No Trace. It’s promoted everywhere. Unfortunately these principles are practiced selectively and conveniently. In other words, hikers reason their one insignificant transgression won’t have any harmful effect. The reality is the opposite. The impact of small Leave No Trace lapses grows exponentially when “everybody” does it. Now back to the reason for this story. Too many younger hikers were not following Leave No Trace ethics, yet hikers 18-24 make up the majority of AT thru hikers. More challenging, the traditional messages and delivery means were not working with this group. 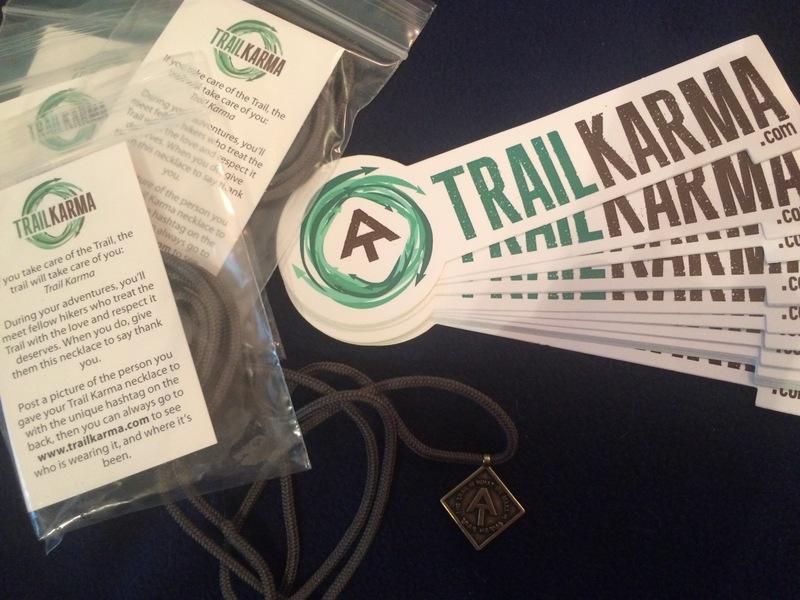 Trail Karma awards and promotional stickers. Enter Trail Karma as a new outreach program: http://www.trailkarma.com. It is a website targeting younger hikers. The Trail Karma awards component of this program allows ridgerunners and trail ambassadors to reward good behavior on the trail when it happens in real time. The Trail Karma Award is a nice AT medallion with a serial number on the back. Hikers can register the award on the Trail Karma website and even pass it along when another good turn is observed. The idea is to reinforce the positive. 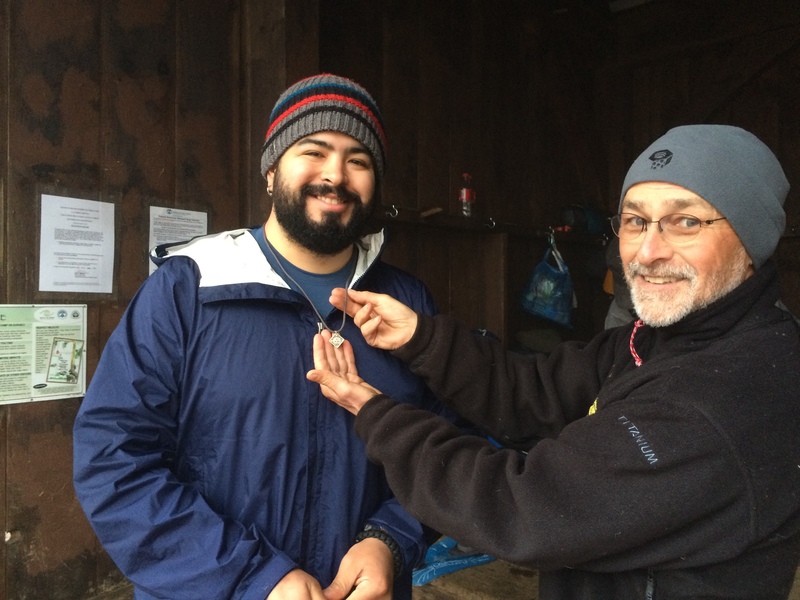 I thought the two Trail Karma Awards I was able to present during my time in Georgia had a positive impact, both on the hikers who received them and those who observed the presentation. Yesterday’s mail brought a CARE package of new Trail Karma awards and promotional stickers. I can’t wait to find good behavior to reward. ***The trails weren’t pristine before the boomers showed up. In the earlier era, hikers and campers built lean-tos, cut pine bows to make beds, chopped tent stakes every night, disposed of food cans willy nilly and practiced a multitude of other sins. Their smaller numbers helped limit the damage which was was eventually cleared up. It’s momma nature’s cure for what ails you – mostly. May be coming soon to Bowie. You near there? Great post, Jim. Thank you for what you’re doing on the Trail. Several of us volunteers are getting ready to make some fun Leave No Trace videos for the Appalachian Trail (see website). Every message we can get out there, will help. I am hoping, that together, we can build a self-policing trail culture that is effective and not heavy handed. Thanks for what you are doing. I had some trouble with the trail karma link. Had to dink around to get to the site. I don’t know if it’s me or the link. The recipients were pleased. One can only hope that translated into future behavior. I was out biking yesterday with my daughter on our local greenway and came upon two girls who had such big backpacks I assumed they were thru-hiking (although for the life of me I couldn’t connect thru-hiking with the much civilized greenway), so I struck up a conversation with them. It turns out that they were in training to hike the AT. They are doing it through a for-credit class at Roanoke College. They’ll be going down to Georgia for the first leg of the trip (although they won’t be hiking the whole trail; only about a month’s worth). So I thought of you, Jim, as I was chatting with them, and your and my conversation on Friday where you were talking about the multitude of people on the trail. I wondered if you knew that even colleges were now sending students off to hike the trail. I’ve met a number of students hiking for credit. Also families home schooling their children. Depending on the rigor of the requirements, hiking on or thru hiking could be a valid educational experience, especially in biology, ecology, geology, sociology, or creative writing. Phys ed maybe too? Don, As you know there is an on-going conversation on this topic. One of the challenges lies in the high probability that weekenders who drive in and abuse the huts are not hikers or lovers of nature for that matter. In that sense, they are particularly difficult to reach.